Over at The Goosberry Fool Caitlin is running an ingenious food blog event – The Global Breakfast Tournament. She wants to know who around the world makes the best breakfast and in order to find out has asked champions from different countries to enter a classic dish from their country. I’m very excited and honoured to be representing England in the tournament and I wanted to share my entry with you, which you can also read on Caitlin’s blog here. I hope you enjoy it! I was delighted when Caitlin asked me if I would represent England in her Global Breakfast Tournament and immediately I knew the dish I would have to enter would be the Full English Breakfast, or ‘the fry up’ as it’s also known. We’re very lucky in Britain to enjoy a wide range of breakfasts from around the world, whether a croissant and latte grabbed on the way to the office, a bowl of muesli or even kedgeree. Toast and a cup of tea features heavily in British homes at breakfast time, as does cereal, but ask most Brits what the ultimate breakfast is here in the UK and the answer will be a resounding ‘the fry up!’. Now I know what you’re thinking: “Greasy, artery-blocking, heavy fried breakfasts served in greasy spoon cafes, well they may be classically British but what’s so great about them?”. Well, read on! 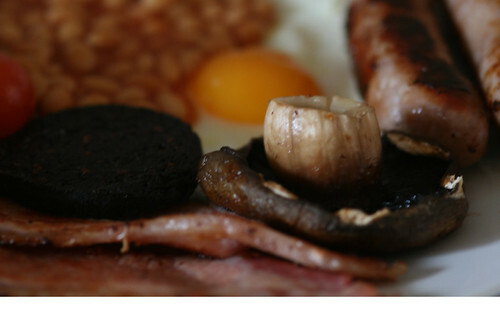 The great British fry up has regional variances across the UK; in Ireland you may find white pudding or soda bread, in Scotland haggis or potato scones are often included and in Wales lava bread may feature. But regardless of where you are in the UK, at the heart of this fantastic breakfast you’ll pretty much always find bacon, eggs and sausages. Being from England, I’ve cooked the Full English Breakfast for my entry. After the bacon, eggs and sausages, generally any combination of mushrooms, eggs, tomatoes, hash browns, baked beans, fried bread and black pudding are added, sometimes with toast on the side for the very hungry. Eggs are sometimes scrambled, but more commonly fried and served runny, and you can’t beat the delight of that first burst of the egg as you dip a piece of sausage or toast into that gloriously yellow yolk. In my research for this entry I’ve found that black pudding is something of a contentious issue. 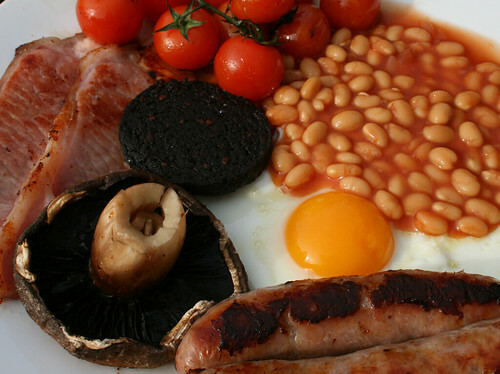 Many people insist that a full English breakfast must include it but quite a few people really dislike it and many don’t even get as far as trying it, being repulsed by the idea of a sausage made from blood. I have to say I don’t usually include it in my breakfast, but as I continued my research and spoke to various people it soon became very apparent that I would be committing blasphemy of the gravest kind if I didn’t include it for this post. So I made an exception and there it is, right next to the bacon, tomatoes and beans! As always, the best ingredients will give the best dish. 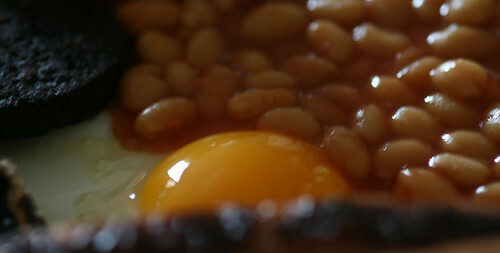 If you use poor quality ingredients you’ll get a poor quality breakfast, simple. So choose large free-range eggs, preferably organic, fresh ripe tomatoes, flavoursome mushrooms, thickly cut bacon and good quality black sausage from your butcher. And now for a few rules, meant light-heartedly but taken seriously by many: baked beans must be Heinz baked beans; sausages must be British, fat and juicy; and whether you prefer brown sauce or tomato sauce the choice can only be between Heinz ketchup and HP sauce. Let’s talk about fat content for a minute. Now I do concede that the Full English isn’t the healthiest of breakfasts, not by a long shot, and if you eat it every day you’re going to pile on the pounds and give your arteries a challenge. 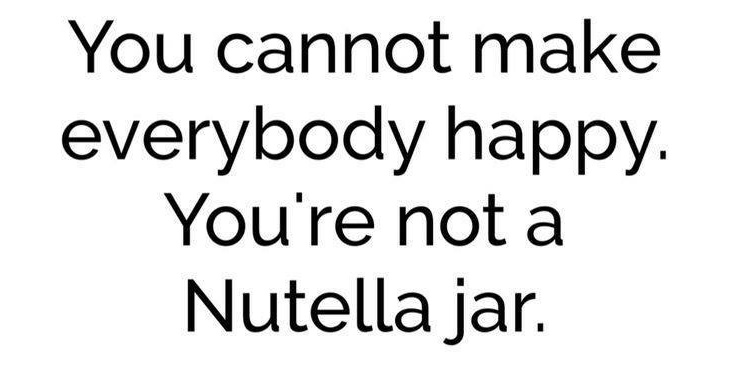 But it really isn’t eaten every day by your average Brit. It’s something to be enjoyed in moderation, a real treat, generally eaten on an occasional weekend when there is more time to potter in the kitchen and really enjoy this hearty breakfast, or when staying in a hotel or bed and breakfast somewhere across the country. Those very concerned about the fat content could grill instead of fry, and many people do, but if you’re looking for true authenticity only the frying pan will do. You don’t need much fat for frying at all – some will come out of the bacon and sausages, and olive oil is a good choice, being healthier than most fats. After frying place the bacon and sausages on kitchen paper to soak up the excess fat before serving it. So just what is it about this part of the British institution that makes it so special and dear to the hearts of so many Brits? Well let me see, could it be the gentle sound of the sizzling in the pan, the smell of the bacon and sausages making your tummy ache, or the oozing yellow egg yolk? Maybe it’s the taste of the mushrooms or the sweet, warm tomatoes that burst in your mouth, or the taste combinations, different with each mouthful. Could it be the way this hearty breakfast fills your tummy, warms you up and puts a contented smile on your face as you read the Sunday papers? 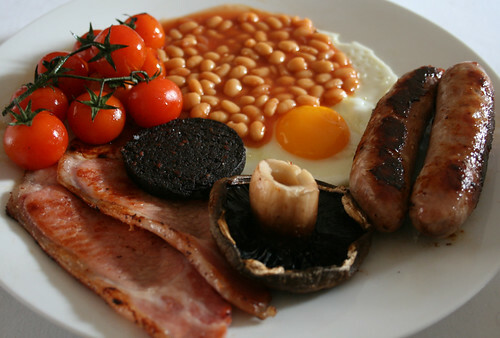 Or perhaps it’s the fact that this breakfast reminds us so much of home and makes us proud to be British; after all, whilst there are many fantastic breakfasts all around the world, no one can do a fried breakfast like the British. Whatever it is, I really don’t think that there’s a better way to start the day. Thanks for this. Had to look up a “Full English” reference from The League of Gentleman. Very nicely explained. Is England a region or a country? A Country? Then why refer to Scotland Wales and Ireland as regions?